I made it to Mt. Hood. Time goes way too fast. Especially when I am crazy busy (okay, this part is not so awesome). Plus, the summer produce here is insane this year. Incredible. I bought berries, melons, peach, nectarines, mangos, corn, zucchini, basically everything, and it all looks so good. And it was CHEAP. So I know I have only been here less than twenty-four hours, but as of right now I am pretty happy with my decision to spend most of my summer in Mt. Hood with my family. Now, if the weather drastically changes I could be singing a different tune. But right now it is awesome and beautiful and I feel pretty darn grateful that I get to see such a cool place. If only you guys could truly see the view I am looking at right now. It is pretty amazing to be looking at a glacier so up close and personal. Right now the sun is hitting Mt. Hood and creating a picture perfect view. Honestly not one thing could make it better. The sky is blue, the trees are green and the mountain is white. Plus, it is HOT and I love it so much. I went to the grocery store twice yesterday, checked out a total of three times and made four trips up the elevator with carts completely FULL of food. Basically renting a place for a couple of months is like starting over completely – kitchen wise. All the pantry essentials need to be bought along with the freezer essentials and the fresh produce, fresh dairy and yada, yada, yada. I am not even sure how long I am staying, most likely till the end of July, but I plan on doing a whole lot of cooking. Surprise, surprise. Someone’s got to keep this food blog running. Today feels like one of those days that my brain just wants to keep rattling on and on. I have so much on my mind, plus a whole weeks worth of vacation dramas to share with you guys. But since I am still scrambling to get everything put away and take two food photos today I am going to save my thoughts. Trust me, I won’t forget them. Or maybe I will, that happens. I swear my brain feels too small. I am requesting more brain space in my next life. This grilled cheese is actually kind of embarrassing. 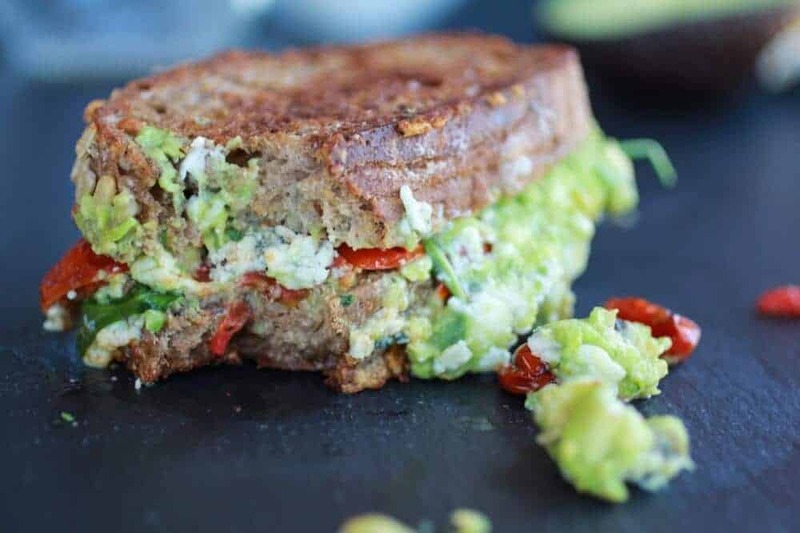 One, it is embarrassing because it is honestly so simple and I am basically showing you how to mash some avocados with blue cheese and toast them up together. Two, because it requires only seven ingredients. It is also embarrassing how excited I have been to show you guys this. Seriously, I wanted to post this the second I finished photographing it. It is so good. 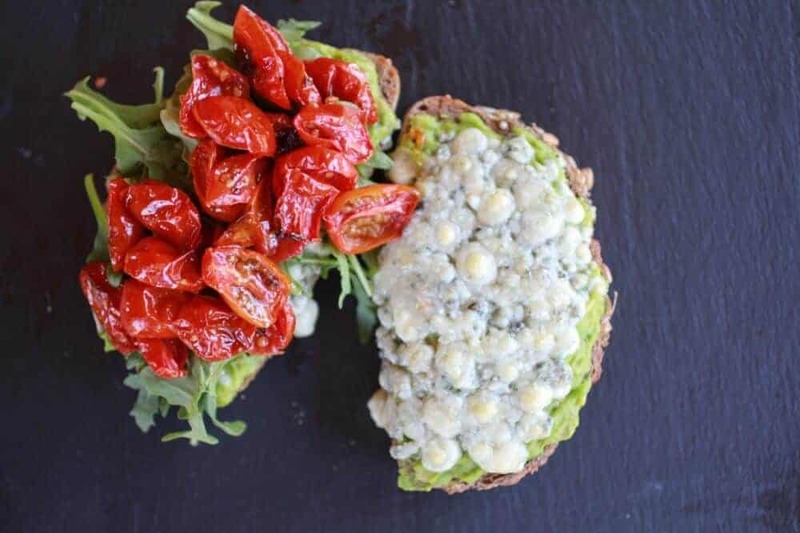 Blue cheese and avocado and roasted tomatoes! Actually this is an adaptation of a sandwich I have been making since the first summer I spent in Mt. Hood three summers ago. 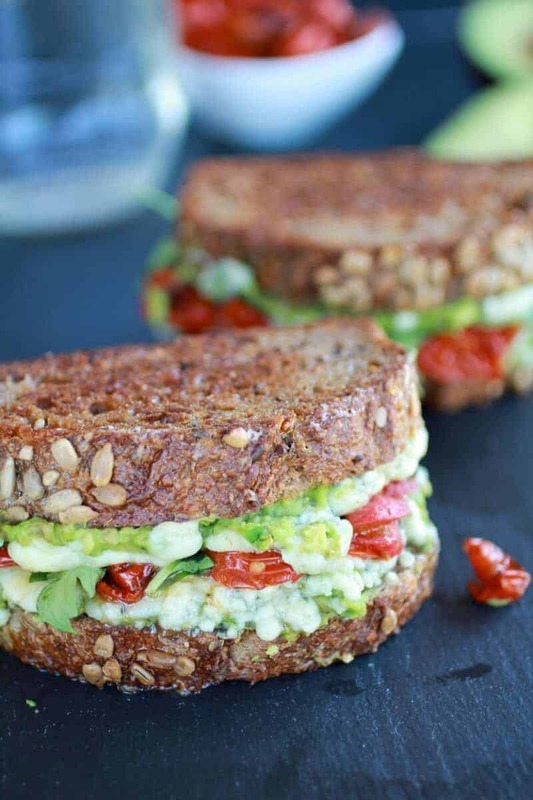 Yup, the avocado sandwich obsession started in Hood. Crazy huh? Back then it was mashed avocado, blue cheese and turkey and maybe some mustard for my dad, but honestly mustard on sandwiches is not really my thing. I think I made this sandwich for my mom everyday that summer. This grilled cheese is just a jazzed up version. The roasted tomatoes are the most amazing addition. Trust me, this grilled cheese tastes over-the-top without the over-the-top effort. Simple and easy, everyone loves that! Grease a baking sheet and add the halved tomatoes. Toss the tomatoes with olive oil, salt and pepper. Roast for 25 to 30 minutes, remove from the oven and set aside. When the tomatoes are finished roasting turn the oven to broil. Lightly mash the avocado with the salt and pepper. Spread one side of each bread slice with softened butter. 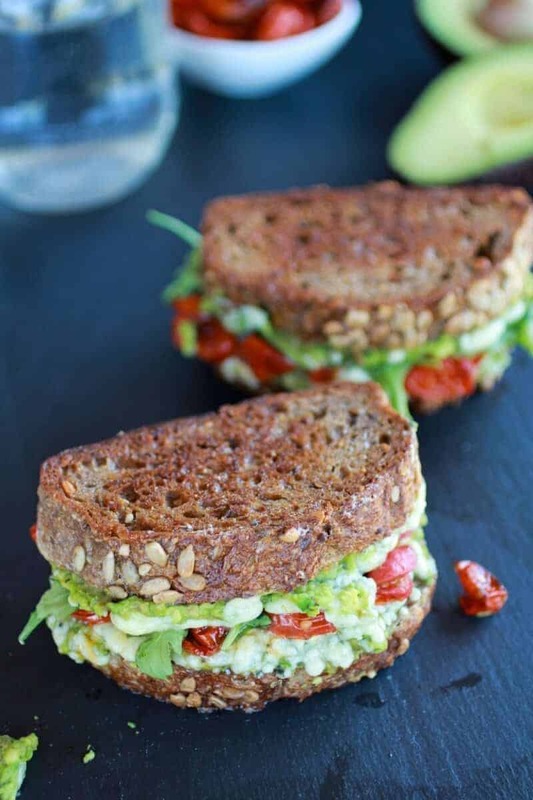 On the unbuttered sides evenly spread the mashed avocado among the insides of all 4 slices of bread. Add the blue cheese right on top of the mashed avocado. Place the slices of bread on a baking sheet and broil for 30 seconds to 1 minutes. Just until the blue cheese begins to melt. Remove from the oven and heat a skillet over medium heat. Seriously, just go make this now. Breakfast, lunch, dinner. Just make it! No embarrassment, only pride for this sandwich! I love quick dinner ideas. Happy travels! So jealous of the produce, the scenery, and that you are eating this right now! Ha! So good, trust me! Thanks Steph! Oh man, why did I no think of that! That sounds awesome! Thanks Kevin! Wow! That looks so good. I’m such a fan of blue cheese with avocado. Must make! Forget the stuff in in the bread. Just give me the bread. It looks sooo good. Blueberry Almond Streusel Galette! Looks so good! Wow! You had me at blue cheese. 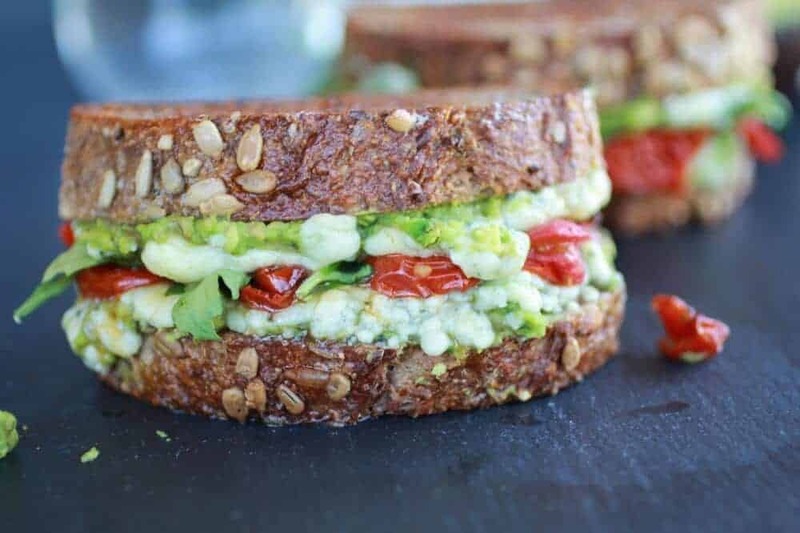 This sandwich looks amazing! 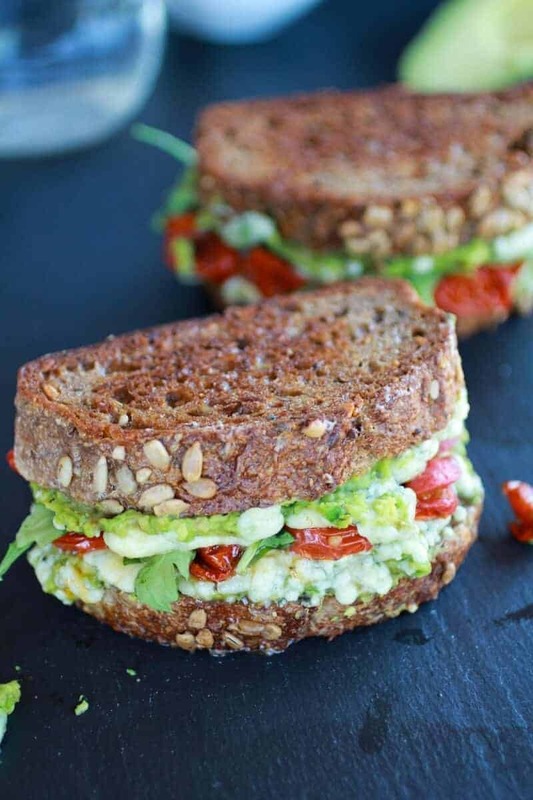 Okay, first of all, this sandwich looks amazeballs. But second, I am a carb fiend, and also pick my sandwiches apart when I eat them, and I am seriously obsessing over this amazing bread. I want like, the entire loaf and some alone time, please. Haha! The bread was from safeway I believe! Yes, you have to! The blue cheese is awesome! YUM. 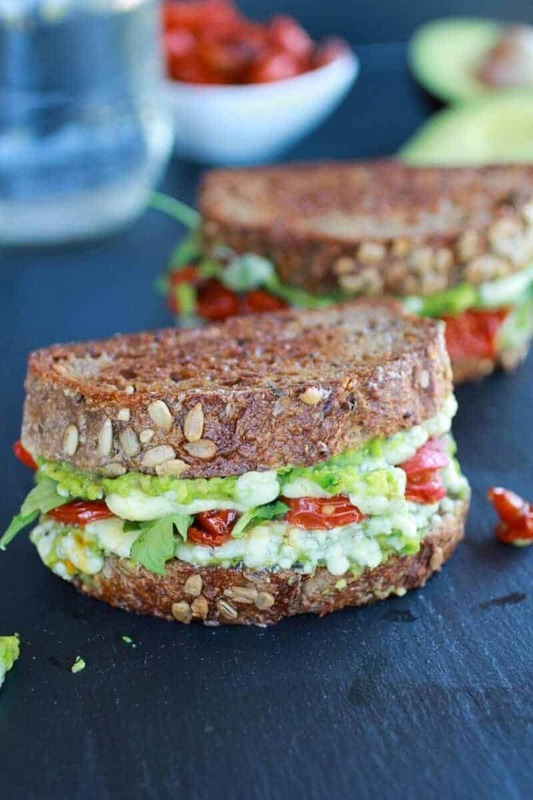 I love avocado…I’ve mixed it with blue cheese before and it’s fabulous. SUCH a delicious sandwich! No need to be embarrassed, my dear…my mouth did some serious watering as soon as I saw the photos and these are flavor combos I wouldn’t have thought of on my own, so I like that I can rely on you for tasty ideas 😉 Look at you taking on the task of stocking the house with food! That requires some serious planning, so kudos to you. Glad you’re having fun in Hood! Haha! Thank you so much, Julia! Haha! I know, it is so good! Thanks Carrian! 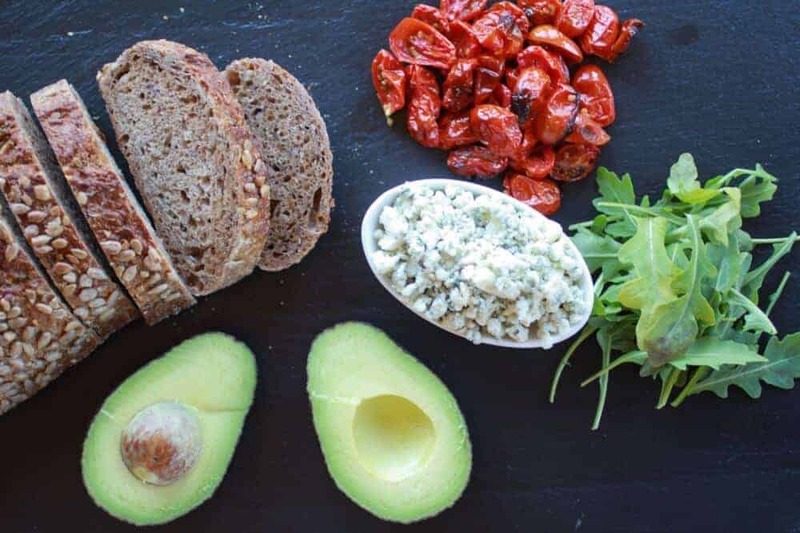 I love everything about this – the little tomatoes, the seedy bread, the avo, the blue cheese! 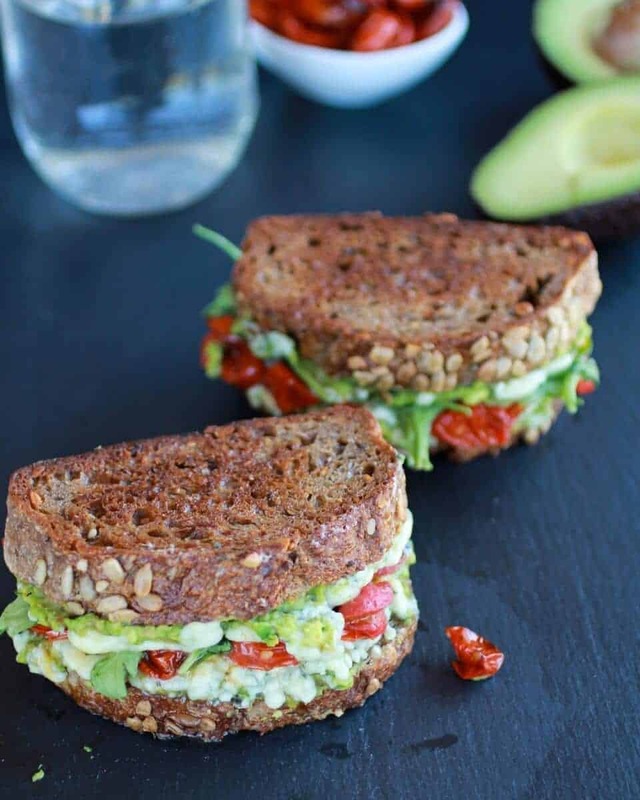 Wonderful sandwich! Thank you, Krista! I bet goat cheese would be just as delicious! Yes! We must see each other! I am smitten with every layer! Gorgeous photos! I always have the worst time photographing sandwiches, but THIS. This is nothing short of a friggin’ masterpiece, Tieghan! Your photos and the flavors both – just amazing! Love this sandwich. 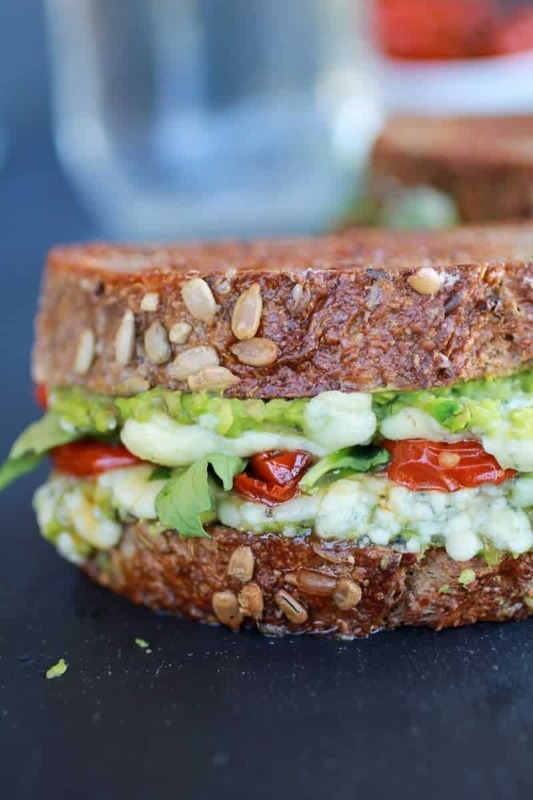 Blue cheese and avocado are the vest, especially together. This is grilled cheese heaven!! Very elegant captures.. looks too good!! Sounds like a winning sandwich to me!!! 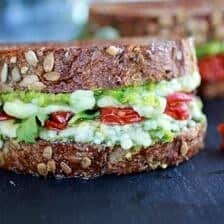 These sandwiches are amazing Tieghan! I love the avocado. Have fun in Oregon! 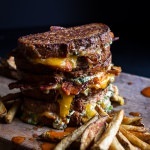 Mmmm – I love creative grilled cheese sandwiches! Thank you so much, Jennifer! I am loving your comments! Yum! I think this is what I will have for dinner tonight. 🙂 Love the avocados in there! Ya! Hope you love it, Annie! Thank you! Hi, I followed you over here from Totally Tasty Tuesdays. I can’t resist anything with blue cheese. And the avocado just seals the deal. And don’t even get me started on the roasted tomatoes LOL! This is on my must-try list and I am pinning it too! If you get a chance, I would love to see you over at the link party I am co-hosting this week (http://www.dizzybusyandhungry.com/2013/07/02/tasty-tuesdays-link-party-2/). Hope to see you there! Thanks again for the great recipe! I think I agree! Thanks you, Nessa! Thank you so very much, Emily!! More brain space — great idea!!! Only I could use it now and not have to wait till the next life. 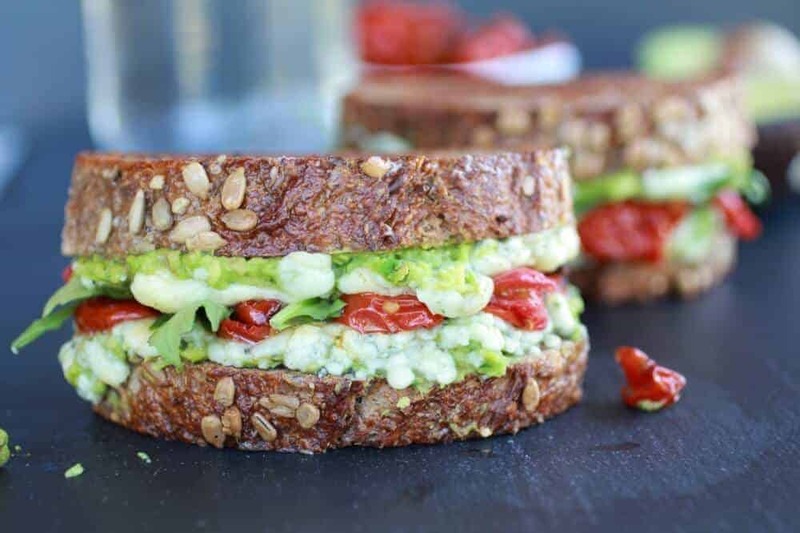 DH will inhale the blue cheese avacado combination — grilled and tomato are bonus! Awesome photos (as always!). thanks so much for sharing on Busy Monday! Mmm, these look so great! Really want to eat them right now!! Haha! I have a pin it button at the end of this post. Just click and pin. I absolutely love this! I’m going to try it today! 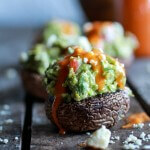 I featured it on my latest post New Ways to Eat Avocado | 10 Savory and Healthy Avocado Recipes. My readers loved it too! Thank you so much, Lauren!! Bacon sounds like and awesome addition! 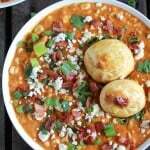 Made these for dinner tonight, FABULOUS!!! 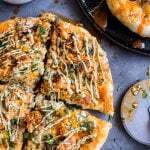 Can I substitute spinach for the arugula in it? Hi Laura! Yes, that will be great!